The annual Consumer Electronics Show (CES) was held last week in Las Vegas, and as usual, major companies (including Sony and Samsung) revealed major products that they’re planning to launch during the coming year. Looking at what’s being scheduled for release, there are plenty of items that can benefit B2B marketers. 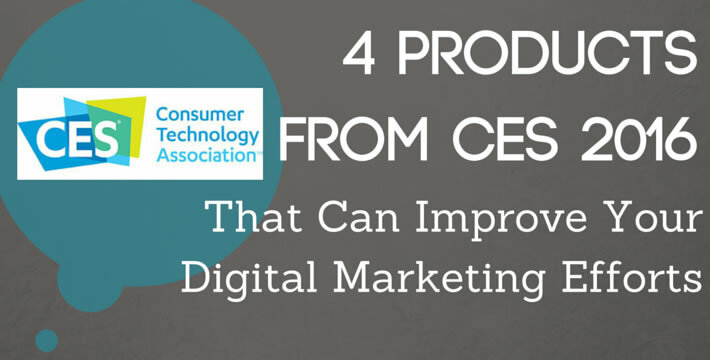 Below are four products that can help any digital marketing company. Enhancing the customer experience is one of the goals of any digital marketing agency, and these products make some wonderful advancements for anyone looking to make creating great content a faster, easier, and more efficient process. 1) Fasetto Link: Storage in the palm of your hand. This little box-shaped NAS (Network Attached Storage) device can now hold more storage than some versions of the 2016 MacBook Air. According to ZDNet, “Link uses solid state drive (SSD) technology to provide from 256GBs to 2TB of storage, transferring files via Wi-Fi at a rate of up to 1900 Mbps.” This product allows any B2B marketer to send information at high rates of speed. If large files need to be transferred while you’re on the move and the file is too big for your phone to send quickly, the Fasetto Link helps solve your transferring problems. 2) Lenovo ThinkPad X1 Tablet: With adaptable plug-ins, this tablet can put in as many hours as you do (extra battery life). Plus, it can assist you with your big day at work (a pico projector for presentations) and show clean, precise images for any project (an Intel RealSense camera for 3D imaging). These plug-ins can help B2B marketers create a professional presentation and allow for flexibility with their adaptations and extended battery life. If there’s something you want to present to other marketers or even a prospective client, being able to quickly set up a presentation is a huge asset. 3) Lenovo’s Link: Ever have trouble adjusting to mobile websites or downloads? Not anymore! Lenovo’s Link makes it easier to share data between mobile devices and desktop computers. In contrast to data sharing on devices, the Jade Primo provides even more options than any of the other products. B2B marketers can use it anywhere at any time; having a “PC in your pocket” has never made digital marketing easier. Ultimately, these products can help with the ever-changing digital marketing world, especially as customer experience continues to be an important topic to consider. In 2016, the abilities that new technologies provide the B2B marketing landscape are both intriguing and exciting. With the constant technological advances that take place year-in and year-out, it’s important that digital marketing agencies don’t fall behind. Many businesses and customers keep up with the latest trends, and having the latest technology is something that clients and customers often follow. So it would be unwise to create a disconnect between the two, because being able to create content and get that content into the webosphere is a priority for any digital marketer. LinkedIn Sponsored Updates: We’re a Featured Case Study! Winner of the inSegment 2016 Scholarship Announced!